Home In the News Become a Friend of the Conservancy: Give Monthly! Join our NEW Monthly Giving Program Today! Be a part of saving the past for the future! Make your gift to the Conservancy go even further by joining the Friends of the Conservancy, our monthly giving program. Friends provide continuous reliable support of our preservation efforts across the country. Make a real difference TODAY with your sustained investment in the race to protect threatened and fragile cultural heritage sites. DONATE MONTHLY ! 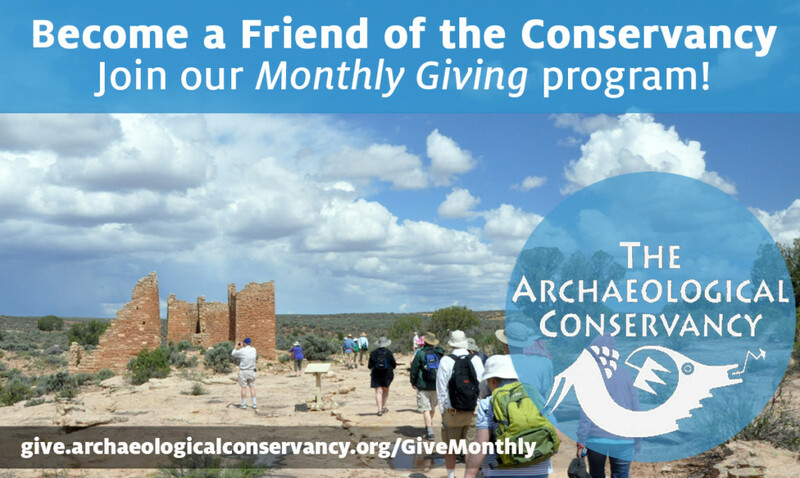 Learn more about Membership Today: Support Saving America’s Archaeological Treasures! Previous articleAmerican Archaeology Fall 2018 is Here!